Hello lovely readers! 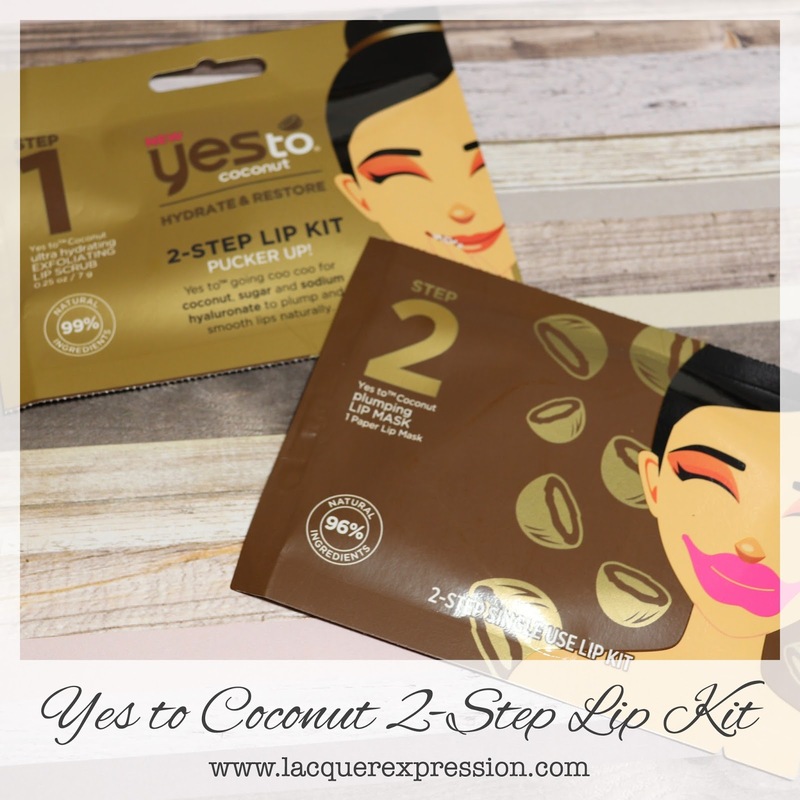 Today on the blog I have the 2-Step Lip Kit from Yest To Coconut. Winter in my neck of the woods has been horrible to my lips. So when I spotted the new 2-Step Lip Kit for single use from Yes To Coconut I decided to give it a try. The kit comes as one package with perforations along the middle. 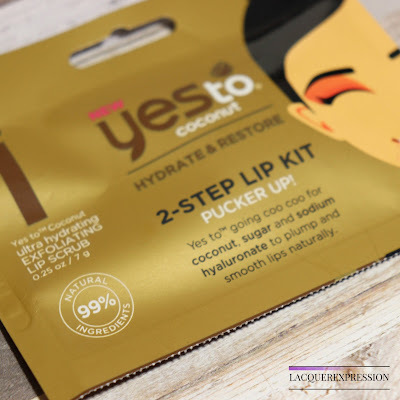 Step-1 from this lip kit is an exfoliating lip scrub. The sugar scrub comes in a small sealed pouch inside the outer packaging and contains 0.25 oz / 7 grams of product. The scrub does have a coconut/ pre-mixed pina colada smell to it and it does taste sweet (I accidentally put some in my mouth when I was putting it on!). The ingredients are 99% natural and include: sucrose, coconut oil, castor seed oil, coconut alkanes (coconut oil-derived silicone), cocoa butter, hydrogenated castor oil, silica, coconut shell powder, sunflower seed oil, Morinda citrifolia fruit extract, guava fruit extract, hibiscus flower extract, orchid flower extract, honey, banana fruit extract, candlenut flower extract, coco-caprylate/caprate glyceryl caprylate, glyceryl undecylenate, flavor, and benzyl alcohol. To use: Apply a pea-size amount of the sugar scrub to your lips using your finger tips and exfoliate by gently massaging in small circles. Wipe off or rinse with water once you are done exfoliating. I had a lot of leftover scrub after exfoliating my lips, so I saved the opened pouch in a small Ziploc bag and stored it in a drawer at room temperature to use at a later time. 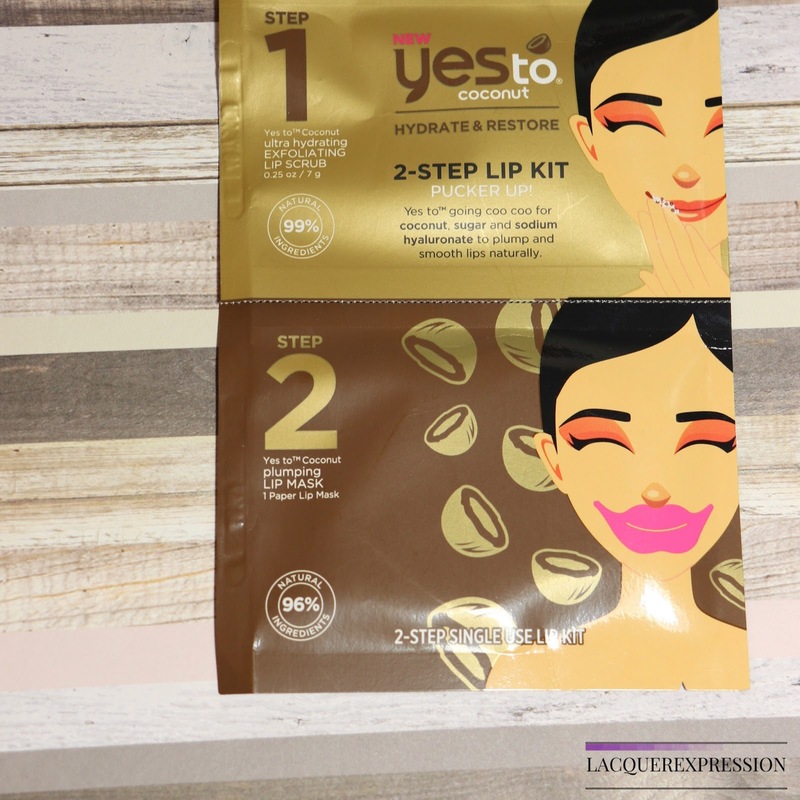 Step-2 is a plumping paper lip mask with sodium hyaluronate, which is used in cosmetics to restore suppleness. The mask comes inside a small lip-shaped plastic case. The mask is hot pink and also lip-shaped. The lip size is exaggerated and would likely cover your lips and surrounding skin. I noticed the same pina colada scent but no chemical taste to it. The ingredients are 96% natural and include: water, glycerin, aloe leaf juice, propanediol, betaine, coconut water, oatmeal extract, hibiscus flower extract, Morinda citrifolia fruit extract, banana fruit extract, orchid flower extract, guava fruit extract, Evodia rutaecarpa fruit extract, honey, Irish moss extract, dipotassium glycyrrhizate, sodium benzoate, xanthan gum, potassium sorbate, tetrasodium glutamate diacetate, citric acid, flavor, coumarin, and limonene. 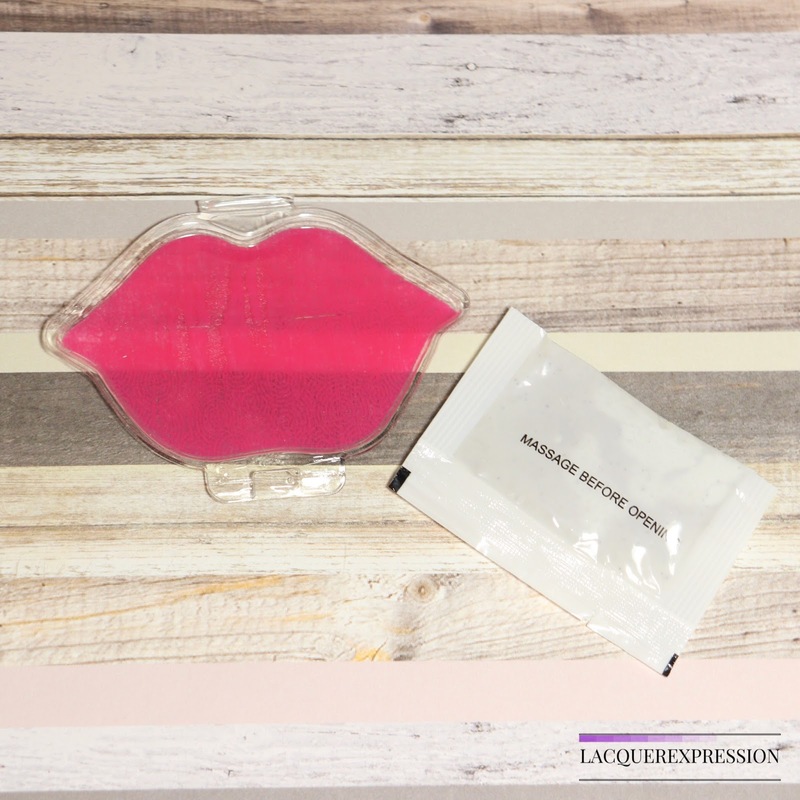 To use: apply the mask to fit the curve of your lips and leave on for up to 15 minutes. The packaging says that you may feel a tingly sensation. Take off immediately if the tingly sensation is too intense or painful. I did not feel any tingly sensation, and I wished I had used Step-2. I don't care for plumped lips, which is a good thing, because this mask thankfully did not deliver. What it did do was leave my lips feeling very dry. I gave this product a try because it is made in the US, it is not tested in animals, and featured mostly natural ingredients. My lips really wanted to love this product but the fake pina colada scent and the drying mask missed the mark for me. Perhaps, the steps should be reversed for better results! And although I will use the rest of the sugar scrub, I will be making my own scrub with brown sugar coconut oil. Coconut oil has hydrating properties and I use it on my skin and hair on a daily basis. The 2-Step Lip Kit from Yes To Coconut retails for about $4 US and is available at drug stores and beauty retailers nationwide. Have you grabbed this lip kit or do you have a homemade recipe for a lip scrub? What a disappointment, especially step 2. It looks like a cute, affordable kit, but if it doesn't work, it's not worth it. I have made my own lip scrub, and I posted about it on my blog, but truth be told, I prefer the LUSH Santa Baby Lip Scrub (yum) and a yummy lip scrub from Good Earth Beauty. What a bummer that the mask was too drying! I don't have a homemade lip scrub, but I love Lush's Bubblegum Lip Scrub! That's a shame the 2nd step was so drying. Especially when you're paying 4 dollars for a one time use product (aside from the leftover exfoliating scrub)! I've read about DIY scrubs as simple as coconut oil and sugar, but I haven't tried any. Do share if you happen to try a good one soon. making your own lip scrub is really better! I was all set to pick this up until I read your review. I've tried some lip masks and they've never dried out my lips. It's too bad this didn't live up to its potential. I don’t think I’ve ever seen a 2 step lip mask before. Shame that it was drying though. Well that’s a bummer! I’ve been wanting to just try something from them and now I know not this! Bummer that this product wasn't all it was built up to be. I haven't tried one of those lip masks yet! Eek, good to know. Thanks for your honest review. 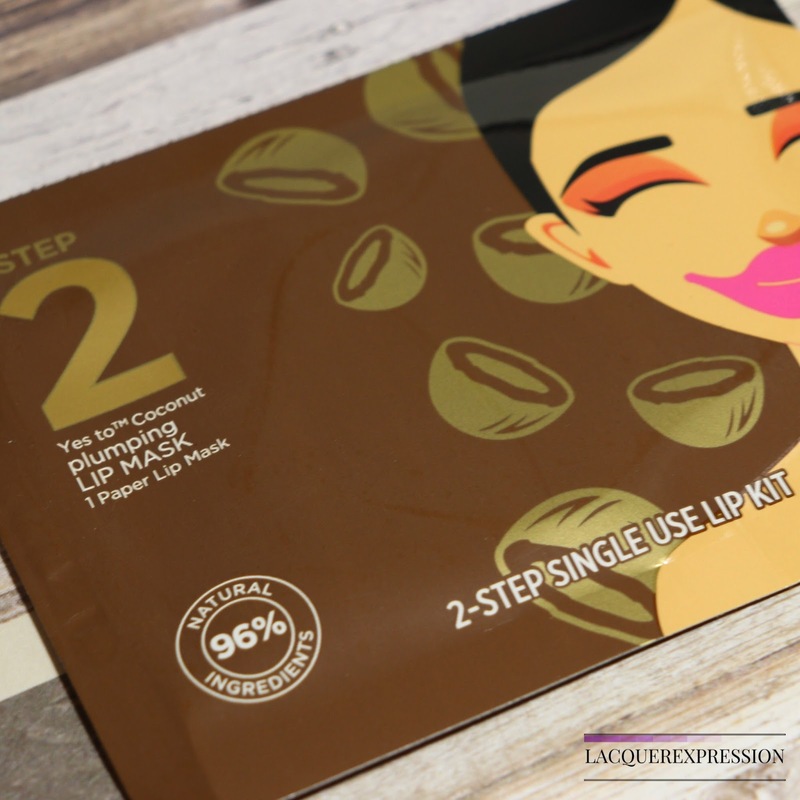 I've been curious about lip shaped masks. I also find that in some of the products in this line, the smell is just off, and in others it's terrific. I wish it was consistent. That's disappointing! I'll stick with just slathering on the lip balm! I actually love lip masks, but only the Korean ones. I feel like Western lip masks are just not the same. Bummer about the lip scrub. I want to try a lip mask but I always chicken out. Well that's a big bummer, but the idea behind this duo lip mask is very neat! Hopefully they improve over time! The concept is cute, but if it doesn't do the job then it's not worth it. I like Yes! products, but recently I have found they are not living up to expectation. How crappy! I loved their face mask but had a friend say that it burned her face so it seems them are pretty hit or miss. I used to really love the Yes To brands but I feel like they've been off their game lately. I had a grapefruit sheet mask that smelled like cheap liquor and disappointment, and I'm wary of any masks of theirs now. I had high hopes going into your review; sorry it didn't work out for you. I feel like I wouldn’t like the scent on my lips like that.